Imagine being a has-been at sixteen. 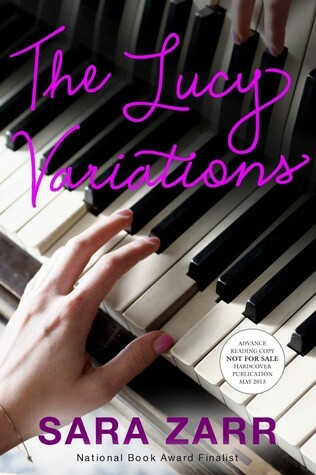 Sara Zarr’s The Lucy Variations tells the story of Lucy Beck-Moreau, a world-famous concert pianist by fourteen, who mysteriously walked away from a concert, and her music career, a couple of years later. Then her brother Gus gets a new piano teacher, Will, who befriends Lucy and encourages her to play the piano again, if only just for herself. Lucy has faced a tremendous amount of pressure, particularly for a teenager, and her ability to deal with it is remarkable. I was a total achiever type in high school, and I can sympathize with Lucy’s need to excel, and her concern that doing something “just for fun” is a criminal waste of potential. Thankfully, my nerditude and desire for straight A’s were much more below the radar than Lucy’s concert career. Unlike Lucy, I never had to deal with hundreds of people watching me, nor did I have to deal with media outlets speculating about my reasons for an emotional decision. So I sympathize. I remember the fear of making mistakes, the fear that each decision I make is momentous and irreversible. I never really outgrew that, but I do remember it being much more intense when I was a teenager. What if I flunk this one test? What if I choose the wrong major in university? For Lucy, her fear that walking away from a concert career means walking away from the piano altogether is exacerbated by her grandfather’s rigid stance on the topic. I can also definitely understand the appeal of Will, the piano teacher who argues that music is, first and foremost, a passion one must pursue, rather than a career. Many of us have been lucky enough to have had an inspiring figure like that growing up, who encourages us to connect with our deepest passions. So I can sympathize with Lucy’s crush on him. The thing is, Lucy believes way too much in her own hype. She grew up as a special snowflake, Mary Sue type character, and acts like it. Can she play the piano again? Does Will like her, like like like her? Over and again, ad infinitum. At one point, another character points out that while Lucy was famous in the concert pianist circuit, that hardly translated into stardom with a general public. Yes! I wanted to say. Thank you! Again, I understand that Lucy puts a lot of pressure on herself, and I can understand the fear of playing the piano again when you know your skills have become rusty. Still, there were times when I wanted to tell her to grow up and get over herself. I don’t think protagonists in books should necessarily be likeable, but when an author creates much more complex and interesting characters to support her, and instead chooses to focus on the protagonist’s sense of entitlement and navel gazing angst, I just want the author to shift her focus elsewhere. Quite frankly, while certainly serious, Lucy’s dilemma is nowhere near as earth shattering as she believes, which makes it all the more frustrating when she expects that her family and friends should be more concerned about her than about their own lives. Take Lucy’s best friend Reyna for example. Reyna is going through some major family issues, and understandably needs to vent. Instead, Lucy pressures her into going to a party and staying at that party just so Lucy will have a ride. Worse, the whole point of Lucy going to that party in the first place is to see Will, a relationship with rather skeevy romantic undertones, considering the age difference and the fact that he is her brother’s teacher. At one point, Gus, who looks up to Will as a mentor and views him as a friend, pleads with Lucy to leave Will alone, so as not to ruin things. The lack of self-awareness in Lucy’s response is grating — she can’t give up Will, because unlike Will and Gus who are really just student and teacher, she and Will actually are friends, and actually do have a connection. I can understand her wanting Will as a mentor, and I can even understand her having a crush on him. But her sense of superiority over Gus — he’s the kid while she’s the mature sibling who can hang with the adults — is just annoying, as is her unwillingness to even consider something that obviously means so much to her younger brother. The Lucy Variations is an interesting book, and Lucy’s situation is certainly one to sympathize with. Still, and particularly after seeing how much Reyna, Gus and the others around her are beyond supportive, I just want to tell Lucy to grow up and deal with it. Thanks to Hachette Book Group Canada for an advance reading copy of this book in exchange for an honest review. This entry was posted in Book Reviews and tagged 50BookPledge2013, ARC, Fiction, HBG Canada, YA by Jaclyn. Bookmark the permalink.